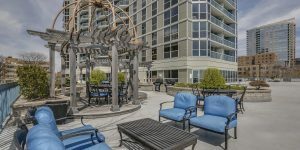 Updated and move-in-ready, this two bedroom, two bath condo is located in the heart of the East Side. With floor-to-ceiling windows, this unit shows off spectacular lake views and boasts a stretch of the city skyline. Custom designed floor plan with an open-concept kitchen, dining, and living area and ample closet space. Kitchen with stainless appliances, granite counter tops and stone tile flooring. In-unit laundry and two indoor parking spaces included. Enjoy the fantastic amenities including indoor pool, fitness center, yoga studio, large outdoor terrace and 24 hour door man. South and East views from this 2 bedroom, 2 bath condo is located in the heart of the East Side. With floor-to-ceiling windows, this unit shows off spectacular lake views & boasts a stretch of the city skyline. Custom designed floor plan with an open-concept kitchen, dining, and living area and ample closet space. Kitchen with stainless appliances, granite counter tops and stone tile flooring. In-unit laundry & two indoor parking spaces included. Enjoy the fantastic amenities including indoor pool, fitness center, yoga studio, large outdoor terrace and 24 hour door man.